A COUNCIL worker told a court how a brick was allegedly thrown through his window moments before four men burst in and dragged him from his home and savagely beat him – only for them to stop and apologise to him five minutes later. Paul Pender claimed he had been the victim of “mistaken identity” when four men, who he named as Jeffrey Fry, Edward Lindsay, Scott Murray and Lee Johnston, attacked him at his home in Anstruther, Fife, in December last year. Mr Pender told a jury at Dundee Sheriff Court that he had returned home from a family night out and was pouring himself a drink in his living room when a brick suddenly crashed through the window. At that same moment he heard “thumping” on his door. When it was opened four men – one of whom is said to have been masked – entered and dragged Mr Pender into the driveway. There the quartet are alleged to have pushed him to the ground before starting a sustained attack. Mr Pender (43), said the beating lasted for “five to ten minutes” but the assault stopped when a witness spotted one of the men in possession of a knife and shouted out a warning and called police. He said: “After that all four all of them jumped over the fence and were trying to apologise to me. “It was actually my son they were after, not me. “Shortly after that Lee Johnston came to my door and said he was apologising and wanted to sort it out. “The police sirens could be heard in the distance and they just disappeared at that. “I was shaken up. I had injuries to my head, chest, face and back – cuts and bruises mostly. Fry (53), of Venus Place, Anstruther, Lindsay (36), of Mayview Avenue, Anstruther, Murray (40), of St Abbs Crescent, Pittenweem, and Johnston (28), of George Street, Cellardyke, deny assaulting Paul Pender and vandalising his property on December 6 last year. 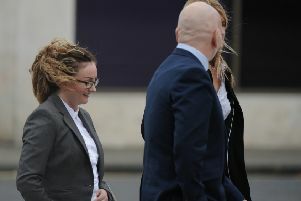 Fry further denies assaulting Shane Pender and Shirley Pender, while Lindsay denies being in possession of a knife during the incident. The trial, before Sheriff Simon Collins QC and a jury, continues.